Sahlep is a starch extracted from the root of an orchid, and is the basis of an infamous stretchy Turkish ice cream called dondurma. Various videos demonstrating the peculiar properties of dondurma are available online, but sahlep itself is rather difficult to find outside of Turkey. When I stumbled on a box of the stuff (albeit adulterated with corn starch) in Houston, I had to try my hand at making dondurma. At a New Year's eve dinner party: what better time to risk abject failure. I first decided that the flavor will be saffron, in keeping with special occasion Middle Eastern food, to be complemented with crushed pistachios. I steeped the saffron fronds in a bit of warm cream to bloom it. In the mean time, in a mixture of cold cream, milk, and sugar, I stirred in the sahlep, and put it on heat. I kept stirring, anticipating the mixture to thicken up akin to polenta. What resulted was alarmingly lumpy and akin to ectoplasm. I stirred in the saffron as best I can, and hoping for the best, put it in the refrigerator to cool overnight. The next day, after some research, I learned that sahlep needed to develop like gluten, so, I decided to first give it a strong whipping in the mixer. Fortunately, that was when the mixture evened out, becoming something between marshmallow and taffy. 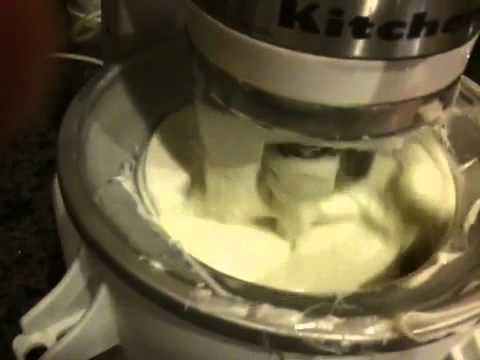 Loading it into the ice cream maker was a challenge, but once it was churning, it seemed to freeze pretty well. The soft serve version was still stretchy and gloopy, but we managed to wrestle them into serving glasses before freezing hard. I think traditional dondurma is whipped even further while being frozen, so our product was not quite so stretchy. But the texture was distinct, almost chewy, and I recognize that if I were to let this stuff melt, it wouldn't liquify. I look forward to experimenting with it some more. I understand that the use of mastic improves the stretchiness, but I am not sure what to complement the piney flavor of mastic.